I recently had the opportunity to review some wonderful Egyptian towels and a 5 star hotel quality mattress pad topper. The products exceeded my expectations. 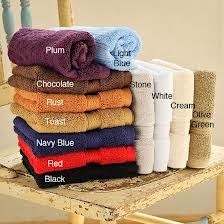 The towels were very generous in size and very thick. The absorbed very well and made getting out of the shower a wonderful thing. The mattress pad made my bed very soft. The mattress pad had a large stretchy skirt which went on my mattress well and is very secure. Exceptional Sheets has great customer service and is a USA based company. Exceptional Sheets is doing an awesome giveaway! 2nd place winner will win a 6 600 GSM piece towel set. Good luck to all that enter. Read on for more information about the company and their products. Contest information follows at the end. Company Overview: ExceptionalSheets.com is an American owned company operated out of Evansville, Indiana. Countless hours of time, effort, and a little luck has helped ExceptionalSheets.com become one of the Internets most trusted and successful specialty linen providers. I desperately need a new mattress pad too! I desperately need a mattress pad topper! Egyptian Cotton Sheets are so soft and cozy!